Today’s TYL Tip is about BACON. 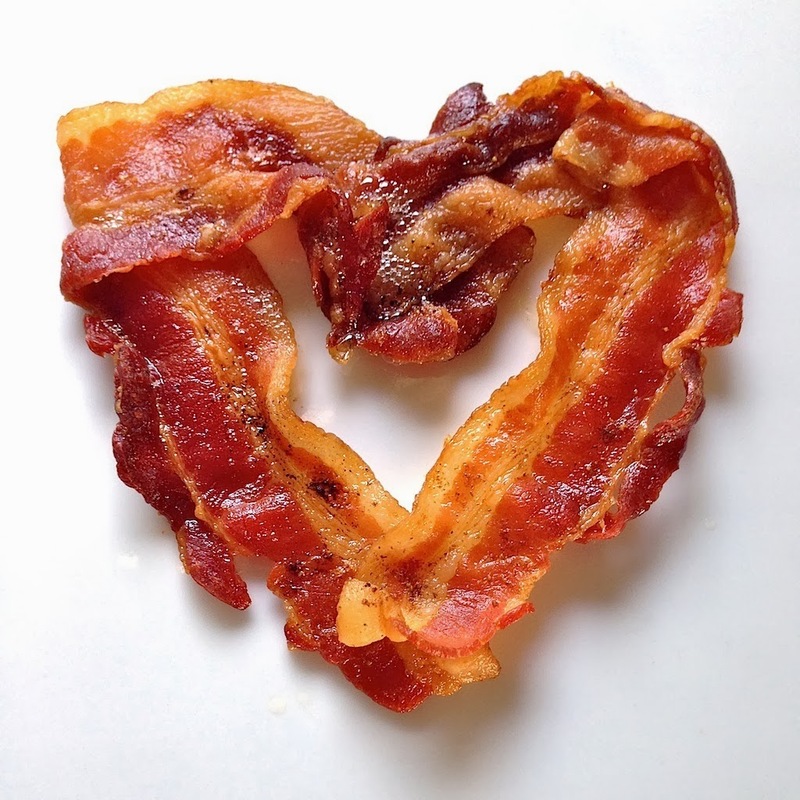 Yeah, we love bacon, sue us. To make your bacon chopping easier, place your bacon in the freezer for about ten minutes before you start chopping. This will make your bacon cutting a breeze! No more messy bacon and almost slicing your fingers off! Don’t forget, when making chopped bacon, always add an extra piece, because lets be real, you’re going to be munching on it, because who doesn’t love bacon? BACON! Something you’ll see a lot of here in our blog. Over the summer, we’ve been to a couple BBQs where we’ve encountered a big mistake, HUGE! The misuse of added bacon nuggets to everyday bbq food, mostly hamburgers. You CANNOT add raw bacon to your raw hamburger meat and expect it to cook properly. You will end up with a cooked burger and little nuggets of Trichinellosis, also called trichinosis! That’s just gross. Place packet of bacon in the freezer for 10 minutes. This makes the bacon easier to cut, otherwise it will just squish around your cutting board. Cut bacon into little pieces. Put the pieces into a cold pan and turn on the heat. Low and slow will give the best result. Now you can mix the cooked bacon pieces into the raw hamburger meat before cooking. This tip also applies when baking, remember to always cook your bacon first! Trust us! We have your back. This is not only a baking tip, but a cooking tip. The other day we we’re making a delicious BBQ sauce and realized we didn’t have a BBQ sauce staple, molasses! So what do you do if you don’t have molasses? Well, you actually have a couple of options. These won’t completely replace the flavor and taste of molasses but they come pretty damn close. Our BBQ sauce (recipe coming soon) is all the proof we need! We’ve been getting a lot of questions about why we use such dark bananas when we make banana centric desserts. Yeah, they look hideous and they’re kind of mushy but the blacker the banana, the more banana flavor you’re going to get! 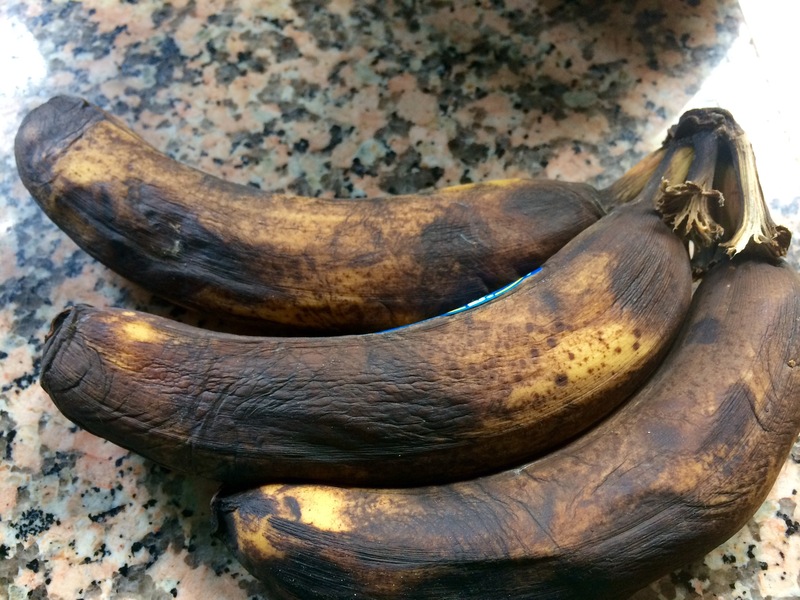 The worst thing about some banana desserts is that artificial banana flavor, but if you use real bananas and let them get black the possibility are endless! So remember, just because the bananas get dark, no need to throw them out! Make a banana bread, muffins, ice cream, or pie! Don’t have a pastry bag? That’ okay. Take your frosting and place it in a gallon bag. Seal the bag and push all the frosting or whipped cream to one side. Snip the corner of the bag and BAM! Pastry bag! Hi! We’re back! Did you miss us? We’re sure you did, but now we’re back and have some many wonderful recipes to share. Today’s recipe is foolproof. It would be really hard to screw this one up. All you need is some bacon and oven. Oink oink! Line your sheet tray with parchment paper. 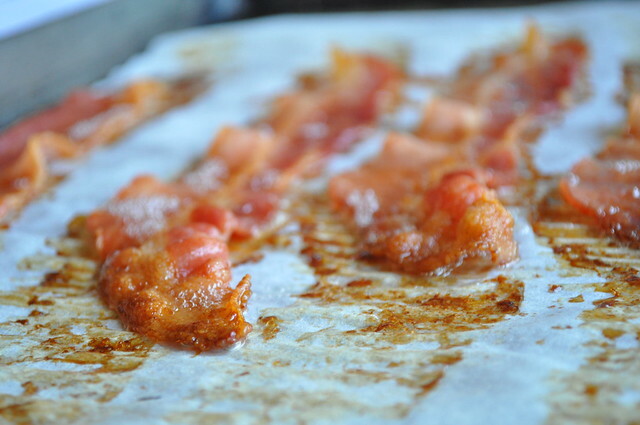 Lay your bacon on the parchment lined tray. 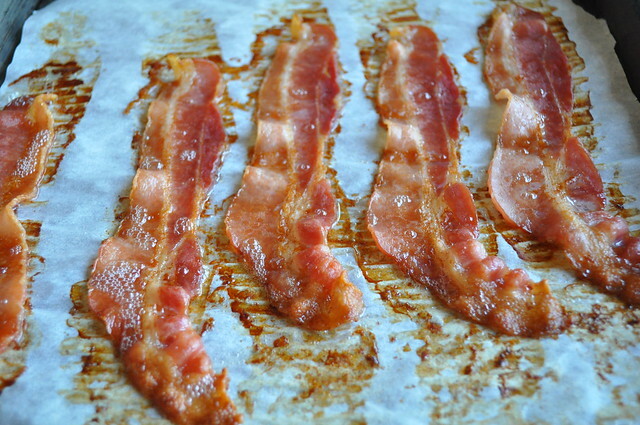 Stick the bacon in a COLD oven, this is really important if you want the most perfect bacon. Once the bacon is in the oven, turn the heat to 400°. Let the bacon cook for about 20 minutes, and then ta-da! Perfect bacon! See? How freaking easy was that? You don’t have to stand over your bacon worrying about it burning! And the best part? No mess and a easy clean up. In a small ramekin, put the water in and stick in the freezer for 3 to 5 minutes. Remove and sprinkle 1/2 teaspoon of unflavored gelatin over the cold water. Let this sit for 5 minutes. Do not touch! Just leave it alone! While the mixture is setting, heat some water. After five minutes, place the ramekin in a larger bowl and pour the hot water around the ramekin. Be careful not to get any water into the gelatin mix. Stir the gelatin until it starts to soften and turns clear. Remove for the water bath and let come to a room temperature (that doesn’t take very long). If adding to whipped cream, only add the stabilizer as the whipped cream starts to take shape, if you add it any sooner, the whipped cream won’t be able to form! A stabilizer is great when making whipped cream, especially when it has to sit out for a while. Growing up in my house (Marlee) we didn’t and still don’t have central air, so making a stabilizer in the summer was crucial to keeping and sort of whipped topping. Making a stabilizer isn’t hard and it’s totally useful in so many recipes! Especially if you have the cookbook (a personal favorite) Milk Momofuku Milk Bar by Christina Tosi. 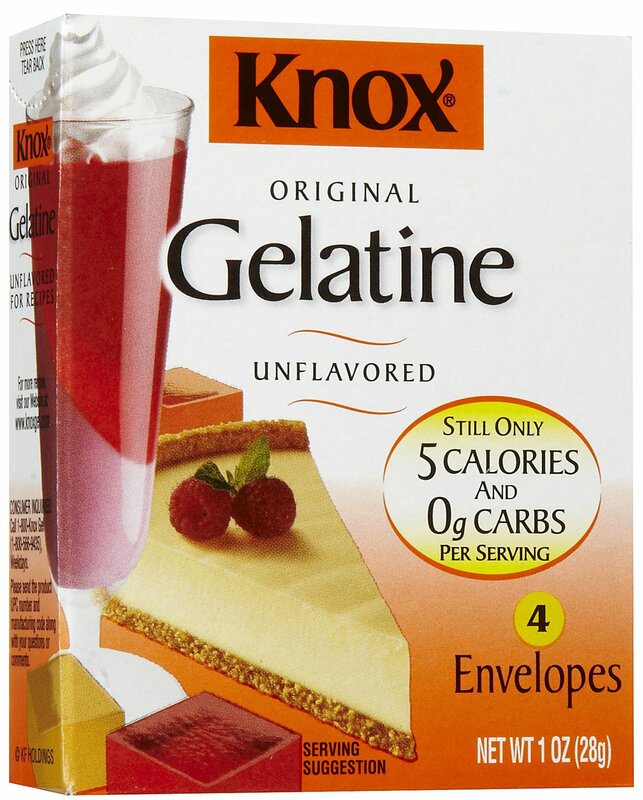 A lot of her recipes call for a sheet of gelatin, but if you don’t have a sheet of gelatin, you make a stabilizer! All very exciting and useful.